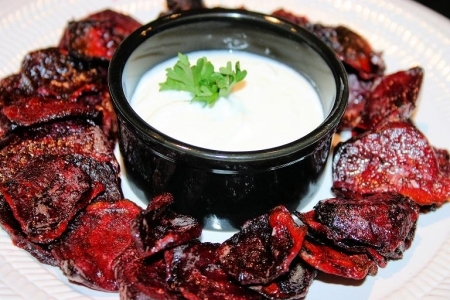 If you love beets or chips, you’ll love this chip version! Beets have a great sweet flavor when baked with a hint of earthiness. Try making these chips for you and your kids to munch on while you get dinner ready or an after school snack! This isn’t just for kid’s serve at your next informal dinner party for a beautiful, delicious and unique take on chips and dip! Rinse, peel and cut both ends of the beet off. Slice beet into circles as thin as you can with a knife. They are dense so be careful when slicing. Also note that beet juice can stain clothing. Place each slice of beet onto a cookie sheet coated with non-stick cooking spray. Once all beet slices are spread evenly onto cookie sheet, spray the top of each slice with non-stick cooking spray. Lightly sprinkle beets with kosher salt and fresh cracked pepper. Bake in preheated oven at 375 degrees for 20-25 minutes. Cooking time will depend on thinness of the beet slices. While beets are cooking, combine goat cheese and skim milk in a small container. Mix and place into a ramekin. Once beets are crisp, remove from oven and place onto a paper towel and blot any excessive oil. Then transfer to a serving dish with dip and serve. The beets look awesome! If I wasn’t so lazy, I’d try to make them. Aren’t they hard to slice? They are dense, but make a base by cutting off a side and use a sharp knife to slice. Better yet use a mandolin if you have one.